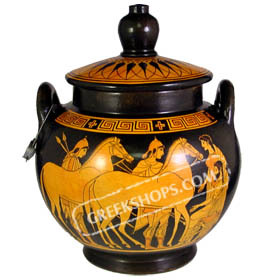 Hand-made ceramic replica of an original Greek red figure vase. Features a mythologial scene and geometric Greek key pattern edges. See additional photos for details. A beautiful additional to your household, or a wonderful gift. Approx. 12 cm in height (4.7").